Can I have email address of the PMO for lodging complaints ? 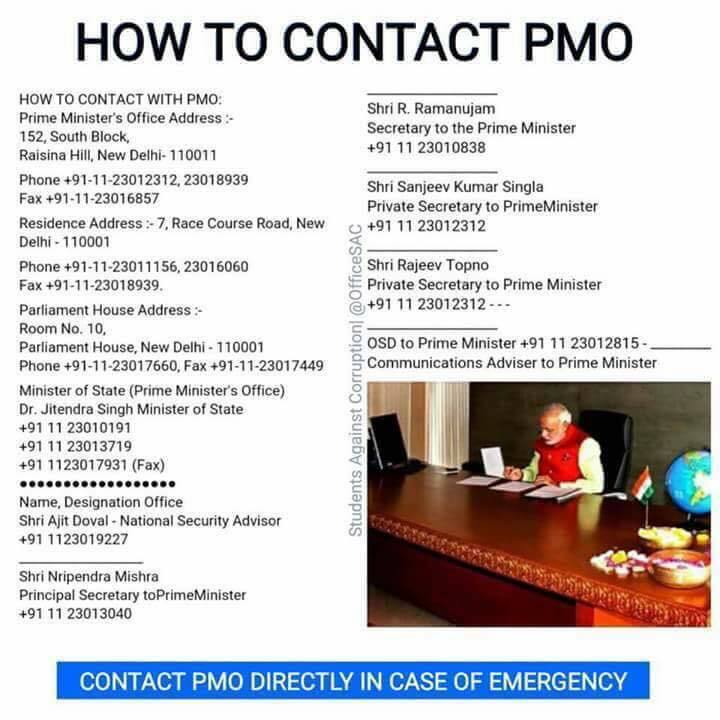 Sir, Can I get email id of PMO ? With Regards, KISHOR K. VAISHNAV. Sir, I have been one girl she got nine years old, I asked SBI manager to accept suknya you Jana scheme he dose not accept pay of 14 each year of 1000 after 21 years she got 6.5 lacks if scheme there or not. PLEASE REFER TO OUR PG NO.DARPG/E/2018/07627 AND DARPG/E/2018/07647, TILL TODAY NO ACTION HAVE BEEN TAKEN SO FAR. PLEASE EXPEDITE THE MATTER. Sir I have complaint regarding daaru mafia in Alipur, Delhi. Residential area mein openly daaru bikti h, lekin koi action nhi leta. So please look into this matter. By considering all his words, I submitted my resignation (forcibly without any option) from my position as Group Leader –R&D and got relieved on the same date at 6.0PM (Note that such practices never seen in my career by any of my previous Organizations and this was my first experience with such unethical firm). But after a gap of 90+ days I received full and final settlement letter from the company [Attached letter No STPL /HRM/ F&F/09/2018-19/05 dated 07th Sep 2018 and no details provided for the amount of Rs 2, 45,047/-(Two lakh forty five thousand and forty seven rupees only)] saying that management agreed only one month settlement as a compensation with all other dues. – This was explained by Mr. Prakash- HR from H.O., Mumbai Over phone on 26-09-2018 at around 2.0PM, but I expressed my strong objections and requested him to rectify and send back the revised settlement amount as per agreed words. Subsequently on next day i.e. 27-09-2018, I sent a mail to company HR’s official E-mail and other concerned people including Chairman of the company, and requested them to settle the dues as per the agreement (also agreed words) on priority basis without any deviations. By seeing all these fraud play from the employer, I am highly surprised that how an Organization in India more specifically M/s Survival Technologies Pvt Ltd, located in Ankleshwar, a Gujarat based organization works by cheating employees like this (making such frauds with employees)? ?, and how govt. will allow such companies to work without taking any actions ?? Hence, my sincere request to concerned person Please look into this issue and get me a justice on priority so that rest of the honest employees should not suffer from this type of fraud managements. My Daughter Durga Banerjee 17 years is special child with CP is in ICU ventilator at Apollo under Dr Anoop Kohli who had been treating him with all sincerity is very critical condition due to Aspiration.Though her lung infection is being controlled but due to epilepsy she slips back & unable to extubate.These has been prolonged for 12 days having been to initially Khetarpal then to Fortis now 4 days in Apollo.Still there is unsurity of the case getting prolonged our all resources r getting exhausted since such child does not have medical cover. My self 61& oo Cancer remission made our life a worst nightmare one can imagine. I plead with you please help us come off this crisis it too late.Till now we spent almost 8 lacs from my lifelong savings with no end in near future but bleek Ray of Hope at Appollo. Sir ap tu grib ke li a he.sir plz moje Sel ne ke li a Jo vi ho ak job di JI na sir .hamara ghr ko koi aadmi ko srkari job nehi he.ak grib lerka ka sath mera sadi huw.aavi mera ak lerki vi he.me ak p.v.t school me teacher krta hu mera selari 2000.sel ne ki but digdari huw he.plz sir help me.